Often, when there are so many things that need attention and doing, its hard to really focus on any one thing. I believe I did this once before here, and thought it'd be a good idea to do again: Pull one card, with the theme/query of one aspect of things or task that would be worth focusing on for self-improvement, right now. I named this Magician as one of my favorites in an early 'Favorite Majors' series most, and I must say that I'm still of that opinion. I particularly enjoy the fact that the Magician here is a woman, but not in the overly feminized and/or sexualized sense seen in some decks - no, she is presented as powerful, and in many ways stylized, like so many ancient statues. This makes clear that what he have here is still an archetype, and idea depicted in human form, but at the same time it universalizes that idea: power and self confidence is not, nor should it be seen as, just a man's domain. "In Siam, Laos and Cambodia, the white elephant grants rainfall and plentiful harvests. 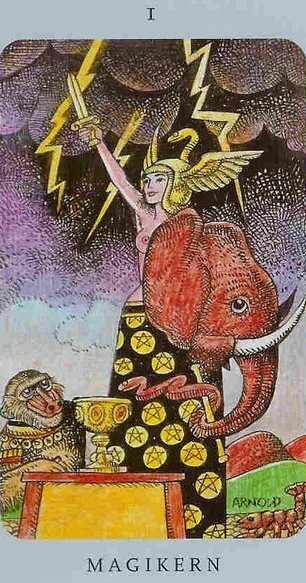 But when ridden by Indra, Lord of the Heavens, the elephant becomes the Storm-God." And what does this all mean, as related to my original query? What should I be focusing on in the very current moment in particular? On myself, it seems, on myself and what I can do, my abilities and strengths. I should focus on self confidence, empowerment, the active, can do, inner motivation and drawing on my resources, in spite of any storm clouds that may be lingering above, darkening the skies. Mundane and esoteric, environmental and personal...how can I empower myself? So reminder here to focus on strengths rather than dwelling over much on the shortcomings. Perhaps in some areas of life I have not made much progress, but in others things have changed and evolved much indeed. There are some things you cannot change or cannot, at this time, overcome. Fine. Focus on what you CAN do, what you ARE capable of, and things that make you feel good about you.